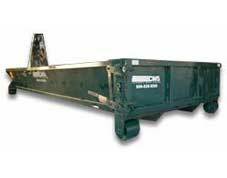 All material must be within the dumpster and cannot exceed the top of the dumpster. 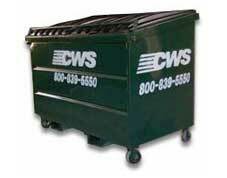 California Waste Services, LLC (CWS) reserves the right to refuse to service any dumpster, which exceeds fill, and weight capacity. Fill in a manner that ensures even distribution of weight. An additional per pro-rated ton fee will be applied, if weight exceeds the agreed tonnage allowance, and under no circumstances shall the overall weight exceed 12 tons. If in excess of 12 tons, an additional "excessive weight" surcharge will result in addition to the agreed terms. 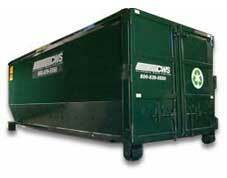 Customer agrees to provide clear access to the dumpster for the purpose of loading and unloading. If CWS is unable to perform service for aforementioned reasons, or a driver is required to wait in excess of 20 minutes, a charge of $95.00 per hour, in addition to a "trip charge" may result. CWS will not accept: all hazardous wastes including any type of liquid or food waste, antifreeze, asbestos, batteries, chemical products, dead animals, flammable materials, fluorescent tubes, herbicides & pesticides, medical waste, motor oil, transmission oil/lubricating/hydraulic oil/, contaminated oils (mixed with solvents, gasoline, etc. ), oil filters, other flammable liquids, paint, partially filled aerosol cans, petroleum contaminated soil/lead paint chips, propane tanks, radioactive material, railroad ties, refrigeration-related appliances, sealed barrels, cylinders or tanks, solvents, and tires, treated lumber, weapons, and any other toxic waste as defined by local, county, state or federal regulations. 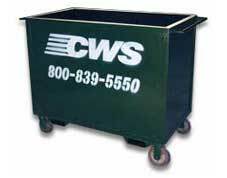 Customer assumes responsibility, financial or otherwise, for any and all, waste materials deposited in the dumpster. 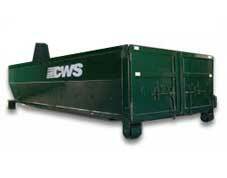 10-yard "low boys" dumpsters are designated for inert materials only such as: asphalt, brick/ block, concrete, dirt, rock, sand, stucco (no wire), ceramic tile, etc. The presence of other non-inert materials including: glass, metal, plastic, trash, or wood, constitutes a "contaminated load", unless the 10-yard dumpster was pre-designated for non-inert material. If deemed "contaminated", CWS may assess a varying charge of $75.00 to $250.00, depending on the severity of the contamination. CWS is not responsible for damages that may occur to customer's property when providing service as directed by a customer or their agents. If the dumpster is damaged by customer, their agents, or third parties while in the customer's care, customer agrees to pay reasonable repairs to said dumpster. This may include severe incidents of graffiti. The undersigned agree(s) that in the event of default or that the account is placed with a collection agency for collection, he/she is responsible for reasonable attorney's fees, collection agency fees, court costs, miscellaneous costs of collection, service charges and/or interest as allowed by law. All terms are Cash Payable on receipt of services, unless otherwise stated or agreed. If terms are extended, the due date is based on the CWS invoice date. A finance charge equal to 12% per annum is assessed on all past due balances beyond stated or agreed terms.